Spiny mice, those unbelievably beautiful creatures. Nothing can beat them; not even the best hamster of rabbit. However, if the quality is to be preserved, or bred to be better, we need selective breeding. What selective breeding is, when it should be used and how that it would do any good - these are the things we'd like to take a good look at with this article! Selective breeding is systematic use of animals to breeding purposes so that each successive generation is similar or better in quality than the parents. Instead of nature, the regulating factor is a human being. So, selective breeding is human guided evolution. There are two goals with selective breeding. First of all, the goal is to get individuals with desired qualities and second, these qualities should be preserved in the next generations. It's quite common to think that getting one successful specimen is enough. That is that - success. This isn't exactly the case - that is only the beginning. Furthermore, there is no such thing as a perfect animal. If the latter goal is neglected, there is no point to breeding at all. The basis for all selective breeding is selection. Stud animals and their young (for future breeding) are selected according to their qualities. Another ground for selection is the standard. Both the male and the female should resemble the standard as much as possible, taking into the account the general quality available. The young resulting from a breeding should resemble the standard as much as possible as well. It is very common not to think that the young will always inherit fifty percent of their genes from both of their parents, that is 50% from the father and 50% from the mother. So, people combine any animals together; if the male is good, the female doesn't have to be. Wrong! The couple should complement each other. This means that the father should be good in the points where the mother is slightly worse and vice versa. In this case, the young are - if you're lucky - generally good. Note the saying: "if you're lucky". This is the down part of breeding - you can never be sure that you succeed in combining just the right qualities in one single baby. Even if you could, it might be that there won't be any! Patience, sustained effort, high pain treshold and common sence. There they are, the basic requirements of a good breeder. What is a good breeding animal like? It isn't possible to define with only a few words, what kind of animal is good for breeding. It can't be generalized either. In fact, we're now going to contradict ourselves by saying that a good breeding animal does not necessarily have to be a good show animal - that is it doesn't have to resemble the standard in every way. The main thing is that it has qualities your other animals lack, be it even tipping or extremely good head - this makes it a good breeding animal. What about the 50/50? Oh, well. If you want to get a quality added into your line, your breeding work will get more complicated. You will have to work a lot and for a long time, if you want to breed fine animals. When there are several qualities to work with, they won't end up in one single mouse and there you have it! It's a little bit like patch working; you work piece by piece towards the goal. How to keep the good qualities? When you have bred one or two good animals, your work is still in the beginning stage. Of course you can take the two to shows and get plenty of prizes, but this kind of attitude is very short sighted. Now you need to get your animals mates of the same quality to get good quality young. Oops! You should have thought of this earlier! Best way to prevent these kind of situations is to start cooperating with other breeders early on in your breeding career. If you work together to get your spiny mice more beautiful, step by step, you have more breeding stock to work with even when your pets are nearing perfection. Inbreeding must be one of the most controversial breeding methods, but when it is used correctly, it is a fast way towards results. If you use it carefully and with consideration, for example using linebreeding, there shouldn't be any problems. However, inbreeding does have its good and bad points. If you are breeding with only one line, you will soon have troubles with every single spinie being closely related. This too, you should take into consideration early on. The best way might be breeding two lines side by side, carefully adding animals from one line to another until both lines are somewhat related to each other. The best benefit of inbreeding is the ability of getting the good qualities of certain animals get multiplied in their young. This means that if the father has good colour but the mother does not, the babies will be something in between. When the babies are mated with the father, there are better chances of getting spiny mice with better colour. If you don't use this kind of breeding with consideration, it can ruin your lines quickly. The good qualities are not inherited alone. Because of this, you should always select only the best young, the ones who are clearly good, for further breeding. A specimen with some bad qualities can be the one who causes the destruction of your lines in the future! It is possible to get new colour varieties with inbreeding (some animal you have used may have carried a new recessive gene, which will surface when combined with another one), but also some hidden diseases. Do be careful. It is better to have spiny mice who have faults according to the standard for a while, than to have spinies with three/five legs! We've been talking about good breeding animals, principles of selective breeding and everything else, but what about the master of the situation? What is the person creating results with her breeding program like?!! First of all, a good breeder is realistic. Furthermore, as was mentioned earlier, she has patience, sustained effort and a high pain threshold. All of these are important. There will be no over night results, not even over a fortnight. It may even be that there will be no results at all. The breeder should be aware of this. Still, the breeder should have ambition. She should also have a love for animals, without it the whole breeding process would be without a ground! It's good to know about genetics, it's also a good thing to have a steady income. Winning in shows means nothing more than having accomplished something. When you get home, you'll you're your spiny mice some more and give them loving thoughts. This kind of person will get results and the spiny mice will love her. Are you like this? 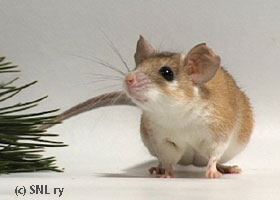 Even if your spiny mice are no beauty queens, you should take them to shows or even show them to other breeders. If you are looking at your spiny mice day in and day out, you will easily develop kennel blindness. This is a situation where you can't see the faults in your animals but think they are better than they really are. If this happens, you are at loss. It is difficult to form an overall image of your breeding animals as is, but the task is somewhat different for an outsider who knows about spiny mice. One further note: Remember that if a spiny mouse has had its ear gnawed off or its tail broken, these qualities are not inherited!! Only those qualities the animal has at birth may be inherited, others do not!! A spiny mouse who has had a mishap is welcome to take part in pet shows and the judge may give it some estimation on the breeding quality there may be. Some people may be put off by the saying: "50% and 50%". Do take into consideration that spiny mice have very small litters, so this 50/50 may not even happen. You see, the 50/50 ratio is meant for much larger populations of animals? So, you'll get three spiny mouse babies - it's quite a luck you have if you manage to get all good qualities in one of them! Oh well, this is excactly what makes the whole things so incredibly interesting! Let's do some selective breeding! !